If you’ve been trading for any amount of time, or have been following any trader worth their salt, you’ve probably heard the term “risk management” before. You may even think you have a good grasp of the concept and attempt to apply it to your trading strategy. While there have been many articles written on the topic, most focus only on the aspect of trading. Good risk management goes far beyond your entries and exits however, and is rarely spoken of. In this article, I’ll attempt to break down the concept of risk management in very simple and easily-applicable manner. Risk Management starts with your personal finances. It is impossible to create a solid risk management strategy without first having a good grasp on your personal finances. “Never invest more than you can afford to lose” has been repeated so often that it’s practically become a meme. Most simply ignore it and continue to drop money into what they see as their ticket to wealth, financial freedom and success. The fact of the matter is that your risk management begins before your money has completed the journey between your wallet and the exchange. If you do not have a budget, if you are living paycheck-to-paycheck and if you do not have a cushion of savings in case of catastrophe, the truth of the matter is that you cannot afford to invest or trade. For many, this is a tough pill to swallow. The fear of missing out on opportunity will have you continuing to throw your money away into the bottomless pit that is the market, with thousands of participants around the globe more than willing to accept your donations. Do yourself a favor, and don’t give them anything that you could potentially regret losing later. So what should you do? First, establish a monthly budget. Determine what you need in order to pay your bills and maintain your lifestyle. Ensure that you have a bit extra to put away into savings (not into the market). On top of that savings, allocate money to pay off debt. Get rid of it, with the possible exception of a mortgage or similarly low-interest and long-term obligation. Once your debt is paid, that money can be put into the market, as you are then playing with extra cash, having already taken care of yourself (and/or your family) with no additional obligations to creditors. This will allow you the freedom to trade without the burden or pressure of needing the money in your every day life. Avoid risking money due to ignorance. Once you’ve created a trading budget for yourself, it’s easy to dump that money into the market, hope to make it big and retire early. This is the wrong approach. An estimated 90% of traders fail within 5 years. It’s not because they couldn’t learn to trade effectively, rather that they run out of capital to finance their trading while learning. Having your income budgeted correctly will drastically help to avoid this, but there is still no sense or glory to be found in throwing money away, regardless of how complex a way you choose to do it. When first entering the markets, your money is best spent on education, not trading a live account. There are a great many mentors and programs available to choose from (and if you’re in the market for free knowledge, we have a few courses you may be interested in). This doesn’t mean you should buy the first course or mentorship you see advertised on YouTube. Look for third-party reviews and recommendations. There are some highly respectable courses and traders to learn from that are well worth their money. WMD4X, The Inner Circle Trader, Simon Kloot and many more have courses available both free and paid, and are well-respected within the trading community. There are plenty of others, just be sure to research before handing anyone your money. Spending the money on a high-quality education is much more likely to yield dividends over the length of your trading career than throwing money directly into the market. As you learn, you will be more prepared to enter the market with a solid plan and strategy which is likely to save you far more than the cost of the course over your lifetime. During this time, I highly recommend using a demo account to place paper trades and to practice the concepts you are learning. You will be more prepared and equipped before placing your hard-earned money at risk in the market. Enter and exit trades with clear boundaries. You may be surprised not to have seen this section at the beginning of the article. This is because the first two parts are equally important, and should be prioritized before you ever place your first trade. Once you have reached this point, the focus of risk management becomes the correct placement of your entries and exits. Many different “rule of thumb” systems exist, but I will share with you mine. On any given trade, I allow my system to point me towards and entry and a direction. Before entering, I ask myself at what price point my trade thesis would become invalid (the price at which I will know for certain that the market is doing other than what I expected it to). I mark both the potential entry and invalidation point on my chart. My next thought is to look for the closest price point which the market would be likely to carry price according to my trade thesis. I mark this level as well. Examining these three levels, I need to determine whether I stand to gain more than I risk on that trade. If I do not stand to gain at least twice as much as I risk, that trade is not worth placing. If it is however, I continue on to the next aspect of my risk management strategy. Determine how much of your account to use on a particular trade. Once I have determined that a trade meets my Risk/Reward minimum ratio of two, I must determine how much size to place on the position. Again, this is my personal “rule of thumb” criteria, and may vary between traders, however it may be a helpful starting point for you. I risk 2% (or less) of my account on each trade I place. This means that even if the difference between my entry and my stop-loss/invalidation point is 20%, I risk a proportional amount of my total account balance so that the maximum I can lose if that spread is filled equals 2% or less of my total portfolio. This may be a bit complicated to understand initially, so we’ll use an example. If my account balance is $10,000 and I want to long asset X, let the entry price of X be $100 and my invalidation point $75. My target is $150. If I buy one unit of X, I am risking $25 for a potential gain of $50. This satisfies my minimum risk/reward ratio requirement, I stand to gain twice as much as I stand to lose. However, if I buy one unit of X, I am only risking 0.25% of my account, since my account is worth $10k. So, I will purchase eight units of asset X, meaning I am both risking eight times as much, and stand to gain eight times as much. This results in a total risk of $200 (8x$25) and a total potential gain of $400 (8x$50). My risk as it pertains to my total account balance is now such: I am risking $200, which is 2% of a $10,000 account, and I stand to gain $400 which is 4% of my account. This satisfies both my minimum risk-reward ratio and also satisfies my maximum total account risk boundaries. Counter-party risk is an understated aspect of risk management, which many people are aware of but few are prepared to handle. Counter-party risk is simply the element of risk that involves elements completely out of your control. In trading, this risk is primarily composed of so-called “black swan” events, i.e; unforseen events with potentially catastrophic consequences. Obviously, it is impossible to plan for every scenario, however it is important to maintain a plan for generalities. The primary risks I concern myself with in this aspect are exchange shutdowns, drastic governmental policy changes, and account hacking. 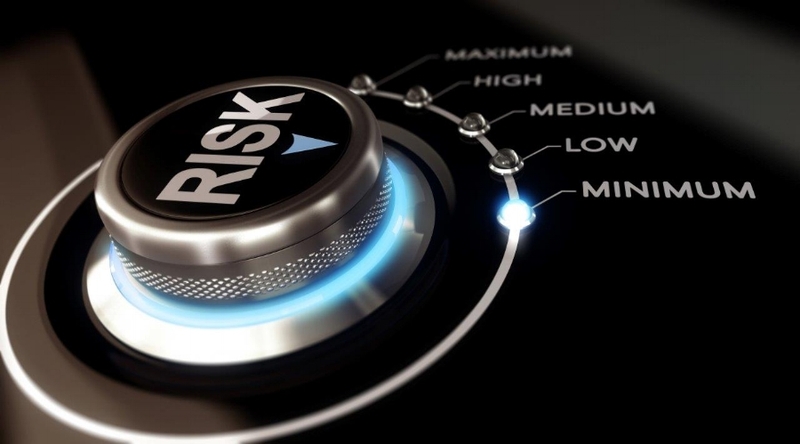 While unforseen circumstances outside of these can certainly arise, being prepared for these three primary counter-party risks will drastically aid in protecting your hard-earned profits. To reduce risk of exchange shutdown or exit scamming (primarily in the cryptocurrency market), keep only what you need in order to trade on a given exchange. You may also choose to spread your funds across several exchanges. Using multiple exchanges increases your online exposure, but also reduces the risk of losing a large amount due to one exchange’s negligence or bad acting. In regards to account hacking, it is imperative to practice proper OPSEC (which is a topic for another article), but basic precautions include always using 2FA, using separate emails for each account you own and nothing else. Never use text messaged-based two factor authentication unless there is no other option available. Protect your privacy both online and offline. Your primary goal while trading is survival. Many people first begin trading with the goal of financial independence, and to make it to the “laptop lifestyle.” While this is admirable, it takes years of practice, patience and account-building to reach this goal. Trading is not difficult, but surviving bad trading decisions is. With proper precautions in place, you set yourself up to outlast your failures and create a potentially profitable career. As a trader, your foremost thought should always be whether you can survive the potential loss you are exposing yourself to. If the answer is yes and the trade meets your system’s criteria, you may have a worthwhile trade on your hands. If not however, there is no amount of justification for the trade in the world that is capable of redeeming it, even if it ends successfully.